Catching a train may be one of the easiest ways of getting around between cities and prefectures due to the amount of trains that run throughout the day, and due to the beautiful scenery that you can see during your ride. 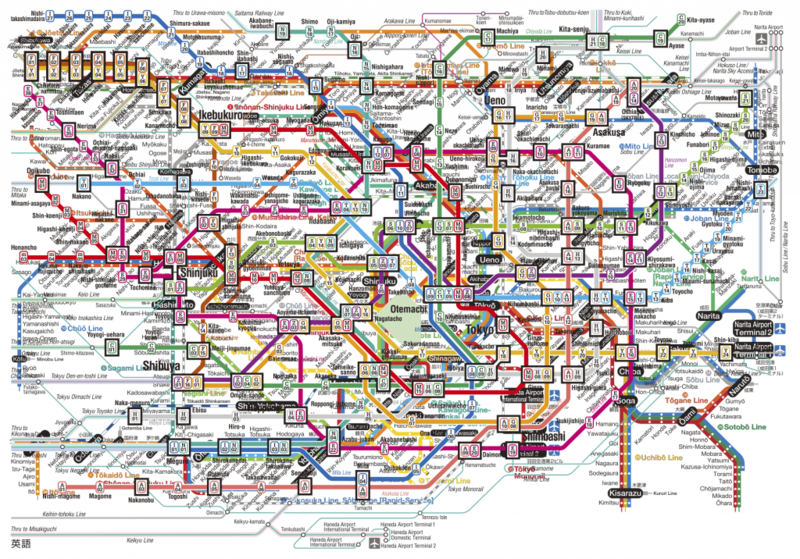 However… For a country that is known for being organised, the train system in Japan is terrible. I mean, trains do run by the timetable, and everything is clear cut, but that is only within each section of train system. When you begin to overlap systems… that’s when it gets confusing. I mean, there is the national railway network, JR, which controls most of the train lines around the country. Then there are the local city subway systems, and then private train systems like the Keioh and Odakyu in Tokyo, Nishitetsu trains (and buses!) in Kyushu, and countless others that I don’t know the names of all around Japan depending on the region that you find yourself in. They all run independently of each other, they have stations located close to each other but that may not necessarily be connected to each other, and if it’s your first time catching a train in Japan, you might find yourself on the wrong platform of the wrong train line and the train you wanted to catch leaving from an entirely different station. So how do you actually go about training it around Japan? If you want to look up your train route by inputting your departure and arrival points, Google and Yahoo will both come up with route options for both shinkansen and non-shinkansen travel. I usually use Google, and it always gives you services with options for time of travel, the cost of the trip, etc. Yahoo is actually more reliable, but only if you use Japanese. You can also get the HyperDia app or the MapsWithMe app, which will both show you accurate train travel route options from any city in Japan. However, HyperDia needs an active internet connection to use, so if you’re not planning on getting a wifi egg or a short term SIM card, then MapsWithMe may be the better option. All these search options also work if you need help navigating a city’s subway system, so try them all out and see which one works best for you! All trains in Japan can be paid for using IC cards, which are used in the same way as the Octopus system in Hong Kong or the Oyster in London. It costs ￥500 for the card, and depending on the area and the train company of your IC purchase, the design of the card will be different. However, although using IC cards are useful and can be used to pay for most train trips, the money that you charge on there will run out very quickly if you start straying out of the bigger cities, and especially if you decide to put in a sneaky shinkansen trip across the country (a normal one-way trip from Tokyo to Osaka by shinkansen costs ￥14250). As mentioned before, JR runs most of the inter-prefectural train lines in Japan. On these lines you have, from fastest to slowest, the shinkansen, limited-express, rapid services, and local services. If you want to explore Japan cross-country and you happen to be a temporary visitor (or normal tourist), you can purchase a JR pass that will save you A LOT OF MONEY because it gives you unlimited access to all JR trains and services (including the shinkansen). This pass can only be bought overseas, so if you’re planning on using it, be sure to purchase this before you get to Japan. If you forget to buy one, or if you’re only planning on exploring smaller areas of Japan, then you can buy JR-area specific passes after you arrive, which usually last less than a week and cost a lot less than the actual JR pass. However… I am an international student right now, and therefore am not a temporary visitor… so how do I travel around Japan without breaking the bank on all these expensive train rides? During specific holiday periods (summer, winter, and March-April), JR sells a ticket called the Seishun 18, which allows you unlimited travel on JR trains for any five days within its activation period. I used this over the Christmas/New Year holiday, and I managed to get myself to five prefectures using just this ticket (I will post about this trip soon!). The Seishun 18 costs ￥11850, which equates to less than￥2200 of train travel a day. However, you are not allowed to ride on shinkansen or limited-express trains, so definitely give yourself plenty of travelling time when you plan your train trips. One stamp for every day of travel you activate~! And if you find yourself in Kyushu, you can get the JR Kyushu International Student Pass to explore and travel around (I did this and it was worth every yen). Despite all the confusion, I actually do think training it around Japan is more worth than flying in and out of the cities, or just staying in Tokyo or Osaka or Kyoto for a week. There’s so much to see and do in Japan, and Japan is one of those countries where the process of getting to a place is half the adventure. Just be sure to thoroughly research your routes before you board a train to anywhere.